Panama’s Pacific coast has been recognized as one of the best places in the world to spend the golden years of life for Panamanians and foreigners alike. But it is not just retirees interested in the area, more and more young people and families are also exploring the Pacific beaches! Whether it is for a weekend retreat or a long term stay, the coast boasts a wide range of activities and accommodations to fit a range of interests and budgets. Coronado was Panama’s first resort community and has since become the central hub of Panama’s Pacific coast. The beach region continues to grow not only as a retirement destination, but as a place to enjoy the weekend and escape from the city rush. One of the area’s appeals is its proximity to grocery stores, banks, medical centers and International schools and of course the beach! These amenities have encouraged more young families to make Coronado home. Whether they are moving from Panama City, or making the longer journey from somewhere abroad. One thing visitors will find in Coronado are more options, far more than those available in other beach towns on Panama’s Pacific Coast. El Rey: The first grocery store to open its doors in the Coronado area was El Rey. The supermarket chain is still a staple place to shop for fresh produce, meat, and grocery items anytime a day, as they are open 24-hours everyday of the week. Super 99: Owned Panama’s Ex-president Ricardo Martinelli, was the next supermarket to hit the beach several years after El Rey. The supermarket is known for their lower prices especially on canned goods. El Machetazo: Sitting on the mountain side of the Interamerican highway, is a three story department store and supermarket. The first level is a typical grocery story, which includes a large canteen style restaurant and bakery. The second floor offers home items like cleaning supplies, dishes and small appliances, as well as a home decor section and clothing section. The top floor has a variety of items from children toys to sport equipment and a large seasonal Christmas department. Riba Smith: The Riba Smith in Coronado, while smaller than most, is a great place to find items that can not be found elsewhere including a large variety of kosher goods. Riba Smith also has a small cafe and ice cream counter. With each major supermarket, has come a large plaza with a variety of other stores opening their doors. So over the past decade a large amount of development has occurred on the highway where Coronado Panama sits. There are currently seven large shopping centers: Las Pergolas, the Coronado Mall, CoroWalk Mall, the Village Mall, Bayview Center, the Coronado Plaza and the newly opened Terrazas. Coronado Mall: Yogen Fruz, Mas Moda, Crocs, +Movil (phone store), Digicel (phone store), Super 99, Bamboo Express (Chinese food), Dominos Pizza, Optima Business Center, banesco bank, Metro Pharmacy, McDonalds, Todo a dollar store, The Coronado Bible church, Any Sport, Panadaria, Laundry Mat, Coronado Dental Clinic, Flamingo Casino, Wanita Salon and various other small shops. El Rey mall: El Rey, Pio Pio (fried chicken), Subway, Global Bank, Banco General, Optica Boyd (glasses), Mailboxes Etc., Dolce Vita Salon. Village Mall: Machetazo, Air conditioner center, Small loans office, Leonardos Restaurant, KFC, Multi bank, Paint store, Happy Pets Vet, Don Lee, Small electronics store, Party supply store, Sesto Senso (Italian restaurant), LIMASA garbage collection agency, Orthodontics dental clinic, Clinica Pacifico doctor's office, Casa Gala sports store and more. Las Pergolas: Riba Smith, Filipe Motta (Specialty wine store), Arrocha Dentist, RefreCool (air conditioners), Sosa y Arango (optician), Novey (hardware store), Specialty meats store and more. There are several growing communities within the Coronado gates. The area continues to develop as more families move in. The first community in Coronado sits just outside of the Coronado guard gate and is centered around a large equestrian center, with stables and a field for riding or polo. Just past the gates the next community is the boulevard with several developments still being built. The equestrian community: It is made up approx. 75 houses. Houses range in size but are typically under the $500,000 price range. The community is set up around the stables. The stables offer riding lessons and are home to several paso fino horses that belong mostly to riders who live in the city and visit on weekends. There are several larger properties for rent in the area, some of which back on to a small lagoon. The boulevard: It is developing quickly, with several large real estate projects. There is a small scattering of private homes along the road, which leads to the Coronado beachfront. The Boulevard is the first left street when coming into Coronado just after the main guard gate. There is a back gate into the Palmeras del golf area, which has just recently started to develop, with several large homes built, and several lots still for sale from Coronado and private sellers. Along the boulevard the first development is Coronado Escapes by the Habitats developers. Around the bend is Brisas de Coronado, currently in its second phase with 32 units built, which share a pool, tennis courts and a social area. At the end of the boulevard road is the development Paradiso, which is still under construction. There are four high capacity beach front condo developments inside the Coronado development, the Coronado Bay, the Coronado Country Club, APRUCC, and the Serena towers. The Coronado Bay is a 24 floor condo with 19 floors of 10 apartments (190 apts. ), the other floors are used for parking, a social area, a roof top pool and gym. The condo is one of the most popular in the area for short term vacationers. The building is also home to many full time residents. The building is in walking distance to restaurants and a mini super. The Coronado Country Club consisted of three towers, which are commonly referred to as the pink towers. Each tower has 24 floors. Tower 100, the middle tower and the first to be built, has two condos on each floor with 3 bed and 3 bath and a maids living space, they are 205 meters square including the balcony. Tower 200, the next building to be built also has 2 units per floor, 3 bed and 3 bath, with 4 bedroom options. Tower 300 has 3 units per floor, ranging from 2 to 4 bedrooms, it is the newest construction. There are also several villas located in the pool/social area located directly in front of the beach. APRUCC is made up of low standing towers offering spectacular views of the Pacific Ocean, the Condos back on to a shared pool and social area, which is directly in front of the beach. There are also several duplexes in the APRUCC development, in the middle of the duplexes is a small park and tennis courts. The Serena Towers are often referred to as the white towers, and consist of two towers which are among the first condos in Coronado Panama. The Serena Towers are located on Playa Serena point, a popular surfing destination on the Pacific Coast. The Condos share a pool and social area. Currently there is two condos on the Coronado golf course, The Coronado Golf and the Alcazar. Punta Vela is a Bern project currently in pre-sale, this will be the third Condo on the course. According to multiple sources it will be the final high density development in Coronado Panama. Bern will be breaking ground on the development any day now. The Coronado Golf is located right on the Coronado golf course, naturally it to golf enthusiasts, however with mountains and ocean views it is appealing to many beach residents. The golf has approximately 160 units, with 1 & 2 bedroom options. The building has three pools, one located in the social area, one of the ground floor and the other on the roof. There is a fully equipped gym and games room. The Alcazar building has four wings, each with a different number of floors. The North and South wings have 18 floors, the East wing has 22 floors, and the South wing has 14 floors. There are only 4 apartments per floor creating open hallways and seemingly private entrances. The apartments are large, with ocean and mountain views. Alcazar offers a promotion where when you buy an apartment you receive membership to the Coronado golf and beach club. There is also an option to buy your apartment furnished. We feel more permanent resident occupy this condo. For those living in the area with young children, school is often a top concern. One of the reasons the Coronado area has become a hot spot for young families is due to the fact that there are several international schools. The main three International schools in Coronado Panama are: Panama Coast International School, The Coronado International School and Five Star Academy. Panama Coast International School: (www.panamacoastinternationalschool.com) was the first International School to open in the area. Located in Gorgona, Panama the school has recently expanded opening a new building to accommodate its growing roaster of students. Five Star Academy: (www.fivestarsacademy.com) is located in Santa Clara about 30 minutes from Coronado. The school has seen a substantial increase in young expat families to the area. Students attending Five Star travel from Coronado and Buenaventura to attend the school their student population has also grown quickly. The Coronado International School: (www.corointschool.com) is the most recent school to open its doors, located in the Coronado community just before the guard gate. Recently the School also announced a future expansion to accommodate high school students. Before moving to Panama, most real estate agents will recommend that scouting the area a good idea to see if the Pacific coast community meets the needs of you and your family. For that reason many often take a vacation in Panama to see if life at the beach is right for them. There are several short term accommodations ranging from resorts and hotels to bed and breakfasts. The accommodations are also popular destinations for those living in other areas of Panama, seeking a fun filled weekend or quite getaway. BlueBay Resort: A new all-inclusive resort inside the Coronado gates. (507 240-4444) – Formerly the Coronado Golf & Beach Hotel, the resort joined the BlueBay family this year after undergoing several renovations including a new pool privately tucked away for guests. The hotel is situation on Coronado’s 18-hole golf course and has amenities including a spa, gym, tennis courts, a kids club, pools and more. The resort also offers access to the beach club and an equestrian club located driving distance from the hotel. Rates range from $90 to $140 depending day of the week and season. Rates are per person as the resort is All-inclusive. The Coronado Inn & Casino: Located on the highway offering full kitchenettes. (507 345-4646) – The Coronado Inn is new to the area, opening in the Las Pergolas plaza. The hotel offers access to the Pacific Casino that sits adjacent, a pool and restaurant. All rooms have AC, hot water, a balcony and kitchenette. Rooms range from $75 for double rooms to $150 for the junior suit. EL Litoral B&B: a quite B&B in the heart of the community. (507 6658-1143) is a cozy B&B is located across from the Coronado BlueBay Resort. Anne-Marie is a yoga instructor and offers yoga classes in her backyard. From Yoga retreats and healthy meals, to a relaxing weekend by the pool, El Litoral is the perfect quite hideaway. There are four bedrooms within the house, two with queen beds, and two with two twin beds. In high season rooms go for $120 a night with breakfast included. Living a healthier lifestyle is often a reason why individuals and families choose this area. Life near the beach fosters healthy living, whether it’s a walk on the beach in the early morning or the abundance of fresh fruit that grows locally, many find the drive to get fit in the tropics. One of the best places to stock up on local produce is in the town of El Valle Panama, approximately one hour from Coronado. There are also an number of fruit and veggie stand along the highway, and several fruit trucks that do business at the entrance to Coronado. Local fruits are well prices when in season. A fresh pineapple will range from $1.50 - $2.00 depending on size and when mangos are in season, you can often pick up 10 for just $1.00. There are also a number of fitness classes in Coronado for those who find it is easier to get in shape with a community of fitness enthusiast and talented instructors. There are two studios in Coronado with daily fitness classes, El Litoral and Lift Studio. El Litoral is a holistic center focusing in Pilates and Yoga while Lift Studio, located in the Coronado Plaza Mall offers a range of classes from Zumba to children’s Ballet. For a full list of fitness classes in the area visit the Playa Community event calendar. While there are lots of ways to stay healthy at the beach, there are also outlets to stay creative, let loose and enjoy vacation, retirement or the simple good life in Coronado Panama. One of the corner stones of community centered activities is Picasso Coronado - a local bar, restaurant, cafe and community center. Claire Ross, owner recently teamed up with Mafalda Smith and Yann Delisle to open the cafe, which is open during the day. The cafe offers a weekly meeting spot for breakfast, lunch and quick snacks. Picasso has become home to events like the Coronado Community Market, art classes, meditation classes, and more. At night Picasso is transformed for dinner, offering live music, open mic nights, trivia and the communities most popular happy hour which draws hundreds of expats on wednesdays from from 5 p.m. to 7 p.m. While on of the most popular, it’s not the only happy hour in the neighborhood. Every Friday Happy Hour takes place at Cafe Caracoles and Bahia Resort. Find Happy Hours, special events and live music in the area, listed in the Playa Community event calendar. While Coronado Panama has become the area's central hub for food, events and community. Activity is occurring all over the Pacific Coast from Punta Chame to Rio Hato. Beaches like Punta Chame Panama, Playa Malibu Gorgona and El Palmar San Carlos offer great fishing and are havens for extreme sports like surfing and kiteboarding, while beaches like Playa Blanca Panama offer some of the top all-inclusive resorts in Panama. While there are over a dozen beaches less than an hour drive from Coronado, the most popular beaches surrounding Coronado are Punta Chame, Gorgona, El Palmar and Rio Hato. The scenic drive to the end of Punta Chame (where most of the development has taken place) is approximately 38km and takes about 40 minutes from Coronado. The area, known as a top destination for the extreme sport of kiteboarding, is popular weekend getaway for adventure seekers. There are two established kiteboarding outfits on the point to learn the sport and rent equipment, Machete kites (507 6674-7772) and Gisela Pulido’s International Kite School at Nitro City (507 223-1747). The point is also home to several local fishing communities, and is the closest place to deep sea fish near Coronado, Panama. Fishing charters range $60 a day for a Panga (a small local boat sometimes shaded), that generally stick to the mangroves and offshore islands like Isla Toce, to upwards of $750 for a sport fishing boat, fully equipped for offshore fishing. For Panga fishing Jose Manuel has a boat available for $60 for up to 8 hours for a maximum of 6 people. For a professional charter any of the hotels on Punta Chame will be able to help. Punta Chame Villas: (507 240-5590) has 15 rooms that range from $138 on weekdays to $198 on weekends (2 people) charging $60 per extra person or $40 for children 4 – 11 years of age. The rooms are comfortable with A/C, Wifi and cable T.V. A Day pass can be purchased for $10 and $20 on holidays, which gives guests access to the beach, pool and amenities. Nitro City: (507 223-1747) is a 36 room, intimate resort with unique amenities and a big name in extreme sports behind it. Travis Pastrana (X-games champ in motocross, now rally car driver) is in town to hang out with guests most years for the resort’s anniversary. Considered one of the best places to play on the coast, Nitro offers some fun amenities like, a wakeboarding lake, skate park, infinity pool, a motocross track, ATVs, skidoos and kite boarding. Rooms range from $150 - $275 (rates change seasonally). Day passes can be purchased for $25. Casa Amarilla: (507 6138-6738) has 10 rooms, 7 hotel style rooms and 3 individual cabins. Rooms range from $35 (2 people) for a cabin with a double bed and fan and shared bathroom to $100 for (2 people) in a private room with en-suite bathroom and AC. Breakfast can be included for an extra $8. They offer amenities including a pool, bar and restaurant and sit walking distance from the beach. Nueva Gorgona, best known simply as Gorgona, is approximately 10 km from Coronado Panama and quickly developing due to its proximity to grocery stores and restaurants. The area boast a consistent surf destination on Playa Malibu (the end of the Gorgona road). Recently a beach bar opened its doors on the point in the white house serving cold drinks, fresh fish and hamburgers every Saturday and Sunday. In town, there is a small fishing coop where fresh seafood can be purchased early in the morning (make a right at Johnathan mini super and stay on the beach road). Lotsawatta Hostal: (507 6677-3426) is an economical option offering private and shared rooms. The hostel has a shared kitchen for guests to use and steps from the beach. El Palmar is a small surf town with several local residences and a growing population. Palmar is a popular spot to learn to surf near Coronado, with a consistent surf break and the area’s best known surf school - Panama Surf School (507 6673-0820). Panama Surf School rents boards and offers lesson for beginners and those looking to advance in the sport. The school also offers a variety of other activities including parasailing, jetskiing, scuba diving and snorkeling. Bayview Hotel: (507 240-9621) has been open since 2002, It is a family friendly hotel and bar & restaurant with a swimming pool and terrace over looking the ocean. The restaurant is open air and casual serving a variety of seafood and beach cocktails. The hotel has 27 rooms with AC, hot water, TV and free Wifi. Rooms range from $76.50 - $87.50 a night. Manglar Lodge: (507 345-4014) This private guesthouse-style hotel shares a parking lot with Bayview. There is a North American style restaurant attached that serves homemade burgers and seafood. There are 3 rooms in the hotel. One room has 2 full size bed, another with one king bed, and one with two queen bed. All three rooms are $120 + tax, two people per room. All rooms have hot water, AC, TV and Wifi. Rio Hato, less than an hour from Coronado Panama has long been home to Panama’s frequently visited all-inclusive resorts. Since the Scarlett Martinez Airport began service again almost two years ago, even more international visitors are flocking. However, the area also has a lot to offer for weekenders and those interested in a long term stays including Pipas beach front restaurant (507 6252-8430) - the area’s most authentic beach bar and restaurant. One of the countries best golf courses is located in the Buenaventura development (507 908-3333). The Royal Decameron Beach Resort: (507 800-2111) offers 820 rooms, 11 pools. All rooms are offered with an all-inclusive stay package, which includes all meals, domestic and imported alcoholic as well as non- alcoholic drinks. Nightly rates start at $79.99/ person (depending on the season). The resort offers offseason special and day passes ranging in price. The Playa Blanca Resort: (507 264-6444) currently has 219 rooms and 3 suites, which were all remodeled recently. The resort is an all-inclusive and situated directly on the beach. Rooms start at $146 for a pool view room. The amenities, pools and buffet are open to the public at a day-pass rate. JW Marriot Hotel at Buenaventura: (507 908-3333) - The JW Marriott hotel has 114 rooms available which range in price from $220 to $600 per night in the low season and $450 to $900 in the high season. The resort offers several beautiful pools and a pristine golf course designed by Nichlaus designs, which attracts avid golfers from around the world. There are also 4 private townhouses available for rent located next to the 18th hole of the golf course. Whether it is fun in the sun or a new lifestyle you seek, Coronado Panama and the beaches on Panama’s Pacific Coast offers a growing list of amenities that make it an ideal spot for vacationing and an appealing location for relocating in Panama. To receive more information on the area directly to your inbox sign up for our monthly newsletter. 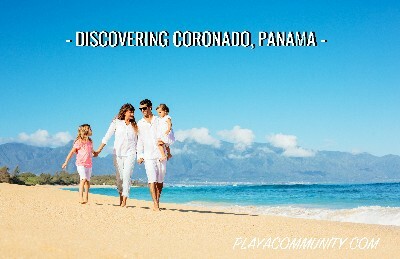 We are your connection to Coronado, the fastest growing beach community in Panama.